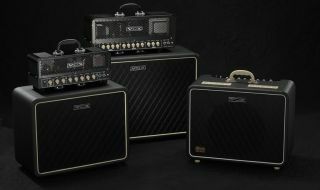 NAMM 2014: Vox has rolled out the latest incarnation of its popular Night Train amps, introducing the G2 range at this year's show. The latest Night Trains retain the bulk of their predecessors features, but adds digital reverb, more channel options and re-voiced tones. Check out the full press release below and head to the Vox site for more information. WINTER NAMM SHOW, ANAHEIM, CA, January 23rd, 2014 - VOX Amplification is showing the all-tube Night Train G2 series of amplifiers. Well-known for its distinct metal exterior design, the Night Train series provides an easy way to enjoy both classic and new VOX tones in a convenient, compact, format. The Night Train G2 series includes the 15 Watt NT15H-G2 and 50 Watt NT50H-2G amplifier heads, plus the 15 Watt NT15C1-G2 - the first ever combo amp with the Night Train name. Optional matching cabinets are also available. The overall sound has been enhanced, featuring full, robust tube tone in a class AB design. The pre-amp is driven by with three 12AX7 tubes; the power amp boasts two EL84 tubes on the NT15H-G2/NT15C1-G2 and two EL34 tubes on the NT50H-G2. The Night Train G2's two-channel design delivers not only classic VOX clean and crunch sounds, but also modern high-gain sounds as well. The GIRTH channel has a powerful, modern high-gain sound that's ideal for the guitarist who seeks an even heavier sound. The BRIGHT channel provides VOX's distinctive clean/crunch sounds and also features a THICK mode that bypasses the tone control circuit and boosts the gain to obtain a thicker tone, for a rich variety of tonal character. An optional VFS2A foot switch can be used to conveniently toggle between the two channels during live performance. A digital reverb designed exclusively by VOX for this series has been added to all models for road-ready reliability and studio-quality reverb sounds. For the guitarist who wishes to integrate pedals and outboard effects, the Night Train G2 amps provide an FX loop. The NT50H-G2 also includes a DI output that can be connected to a mixer or PA system. The optional, dedicated speaker cabinets are a perfect match for the amplifier heads, both aesthetically and sonically. The V212NT-G2 contains two G12H anniversary model speakers that were specially produced to commemorate the 70th anniversary of Celestion, and whose voicing complements the NT50H-G2. The V112NT-G2 contains one classic Celestion G12M greenback speaker. Both cabinets feature a rounded, retro exterior. The Night Train G2 series amplifier heads feature a black gloss finish; the combo amps and cabinets feature a rounded retro look with VOX black diamond grille cloth. Both are equipped with suitcase-type handles.